2011 U.S. OPEN DAY 4: Serena Is Taking No Prisoners! In 2010, Venus Williams tried for a US Open title with her sister sidelined. This year, the roles are reversed, as Serena Williams continued her summer comeback Thursday, defeating Michaella Krajicek of the Netherlands 6-0, 6-1. The win comes one day after Venus removed herself from the main draw, citing a recent diagnosis of Sjogren's Syndrome - an autoimmune disease where white blood cells can damage the vital organs of the body and cause fatigue and joint pain. Serena, who herself has battled medical maladies such as foot lacerations, a hematoma and a pulomary embolism since her last Open appearance in 2009, steamrolled Krajicek - a qualifier - in a tidy 49 minutes to make it two-for-two for her inside Arthur Ashe Stadium in the last 48 hours. The abrupt announcement shocked many in the tennis world and created a Google search rush on "Sjogren's Syndrome." Yet, despite being concerned as any family member would be, Williams revealed that putting her sister out of her mind "wasn't that difficult." "I know she's a fighter and she's really strong," Williams said. "She's great. I think she's really happy now that she knows what it is after all this time. I think, if anything, it's gonna help her now to treat it and go forward." The three-time Open champion channeled the dominant form she displayed in years past, when she was winning titles in 1999, 2002 and 2008. As the crowd in Ashe shouted words of encouragement to the American favorite, Williams fired 10 aces and converted five-of-six break point opportunities. Krajicek, meanwhile, did not convert her only opportunity to break in the match and committed 18 unforced errors. Very little went right for the 21-year-old journeywoman, making her first main draw appearance since 2007 when she also lost in the second round. The victory was so lopsided that when Krajicek finally won a game, a soaring roar of applause met her modest triumph - it was just one of those days. "I told her after the match: 'Welcome back,'" said Williams of Krajicek. "I know she's been going through a really tough time, and not to be discouraged - I hope she doesn't because she's played well. "She qualified here and won a round, and she never gave up today no matter what the score looked like. I thought it was a really tough match. It was good for her and, you know, she's still young. Her whole life is ahead of her." Williams defeated Serbia's Bojana Jovanovski in the first round, 6-1, 6-1, in her first match since losing in the '09 semifinals to eventual champion Kim Clijsters. Seeded 28th, Williams could be involved in a star-powered clash on Saturday should No. 4 Victoria Azarenka advance over Argentina's Gisela Dulko. The two play later in the day inside Louis Armstrong Stadium. 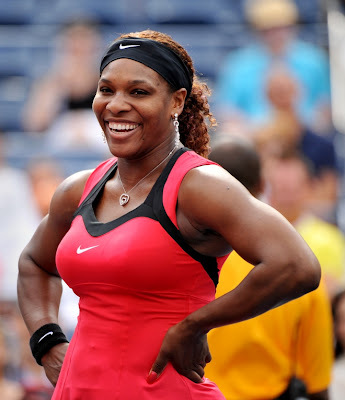 If it is Azarenka, Williams believes that she will "definitely be the underdog." "(Azarenka) has been doing everything good," Williams said. "She moves her feet I think better than anyone on tour, to be honest. She's always moving, and that's really enabled her to get ranked high where she is and have such a great year ... I feel like I have nothing to lose in this match if I have to play her."